Click here for similar courses in Tokyo (the exciting city), or Nagano (heart of Japan). Learn overall Japanese (all 4 skills reading, writing, listening and speaking). 20 lessons of Japanese per week, Monday to Friday (4 hours a day with breaks). Optional electives after you reach intermediate level, helping to get into university, vocational college or finding a job in Japan. 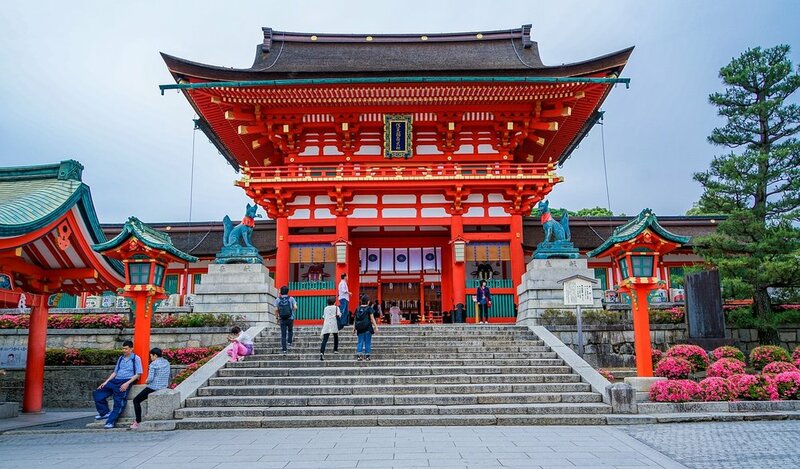 Experience the culture of Kyoto. Just outside the school building, you can find hidden temples in the quiet residential area, hop on a train to famous places for fun cultural activities, or simply soak in the beautiful nature. Dormitory facilities (single or twin rooms) available. Homestay is also an option, offered by the school at 5,300 JPY/night (2 meals included). Private accommodation can also be organised; inquire for further details. Free Wi-fi, student lounge, computer stations, English-speaking staff available and part-time job finding support. All classes are conducted in Japanese. This 'direct' teaching method allows you to start thinking in Japanese, meaning you will learn at a much faster pace. To those on a student visa with excellent grades and attendance, who are studying for over one year. (Maximum study duration is 2 years on a student visa. You most likely need a student visa if you would like to study for over 3 months. Contact us and we will walk you through the process). This school accepts complete beginners! It is recommended to learn the basics before arriving, of course :) Free resources can be provided if asked. The school can introduce you part-time jobs if you are allowed to work (inquire for details). -School festivals and fairs throughout the year. -Career Guidance: One-on-one interview practice & career counselling service is provided. Note: The electives are no extra charge, and you do not need to choose now. Just pick ‘Study Japanese in Kyoto’ for the course name. In the beginner’s level, students will learn the basic Japanese including reading, writing, speaking and listening in a well-balanced manner. In intermediate and advanced levels, students will take Core Classes for 16 hours and elective classes for EJU (Examination for Japanese Universities) or JLPT (Japanese Language Proficiency Test) for 4 hours per week. Students will have field works, speech practices and research presentations based on their Japanese level. In EJU elective classes, students will study reading comprehension, listening and reading comprehension and essay preparations. Students will learn from past exams and how to find the answers and score high in the EJU. At the beginner levels, the student will learn the basics by learning reading・listening・writing・speaking. At the intermediate and advanced levels, after taking 16 Core Classes per week, the student can choose 2~4 more classes per week electives such as JLPT preparation or conversation. For those classes with lots of students that do not use Kanji, there will be a lot more time spent learning kanji so they will not have problems once they go to college. Also, in order to deepen the understanding of the Japanese culture, different types of activities from time to time are scheduled. College trial classes are scheduled about 3 to 4 times a year. The students will have the opportunity to attend different classes and take a look at the vocational schools/colleges before they apply to them. It stands for the Japanese Language Proficiency Test, and is used to assess your Japanese level. The levels go from N5, basic Japanese; to N1, advanced Japanese. To work full-time in Japan, it is recommended to have at least N2 level of the JLPT. The JLPT is a useful benchmark to have as a clear goal for improving your language ability. JLPT will take place in July and December and the classes will be conducted to pass the test. It will strengthen your knowledge in vocabulary, grammar, reading comprehension and listening for the test. Before the exam you can practice tests and solve problems to overcome your weaknesses. Those who aim to pass N4 or N3 are eligible. You will be placed in the appropriate level, after a placement test on the first day of language school in Japan. Complete beginners are also accepted, 4 times a year; in the 2nd week of Jan, April, July and October. Other levels will be placed in the appropriate level after a level check test on the first day. Inquire for individual guidance. In just 10 weeks (3 months) from complete beginner level, you will reach JLPT N5 (Japanese language proficiency test beginner) level & know 150 kanji. In just 1.5 years (18 months) from complete beginner level, you can reach JLPT N2 level, enough to get into university, vocational college or full-time employment using Japanese! JLPT = Japanese Language Proficiency Test. Most internationally recognised test for Japanese learners and employers. See the facilities! Includes a cafe, library and wide ventilated classrooms. Class time will depend on the Japanese level, so students will not be able to choose between morning and afternoon classes. Flights are not included, as courses are flexible and students prefer to make their own travel arrangements. Assistance can be provided if required. You can choose to add this or not. The schools provide accommodation for you, such as in a host family’s home, share house, school dormitory or private apartment. We can also help with looking for other accommodation. The minimum school accommodation is approximately 45,000 JPY/month including bills. Accommodation will be decided after applying to the school. Choose course -> Apply -> Choose accommodation -> Receive confirmation and pay school -> Prepare for Japan!